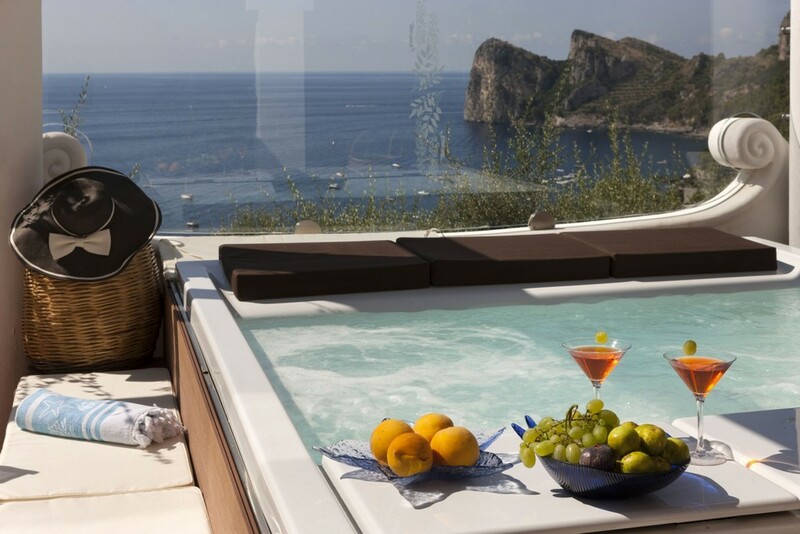 Embedded overlooking the ocean on the natural sea cliffs of the Amalfi coast in Italy, you will discover the luxurious 7-bedroom Villa Marinella. 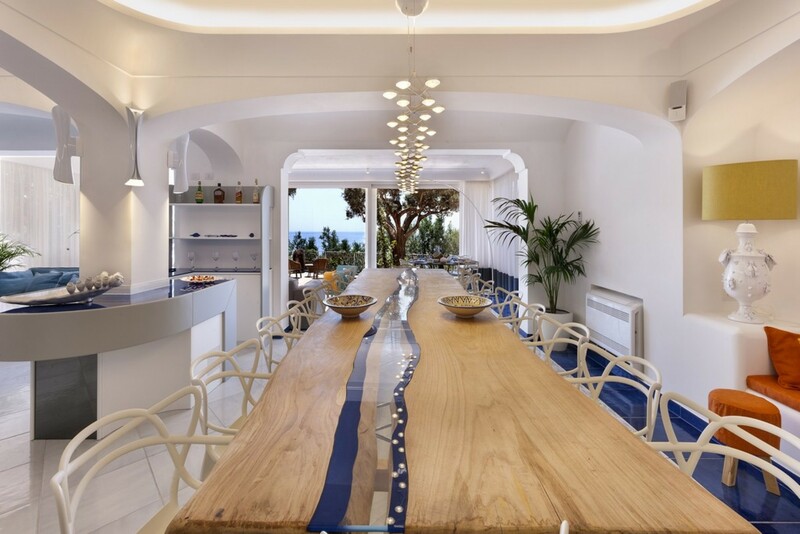 The villa is based in a serene coastal town in Marina del Cantone near the southwestern region of Sorrento and enjoys panoramic views over the Bay of Naples on the Sorrentine Peninsula. 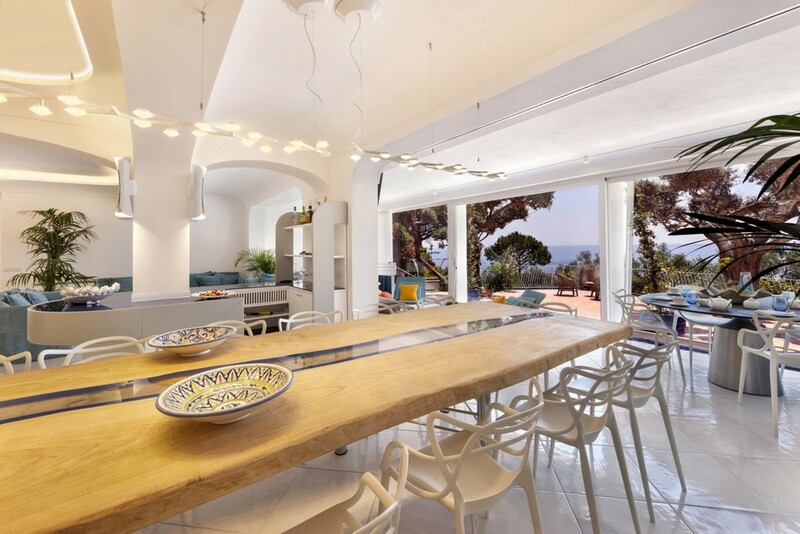 Overlooking the iridescent colored waters of the bay this villa can accommodate up to fourteen guests. 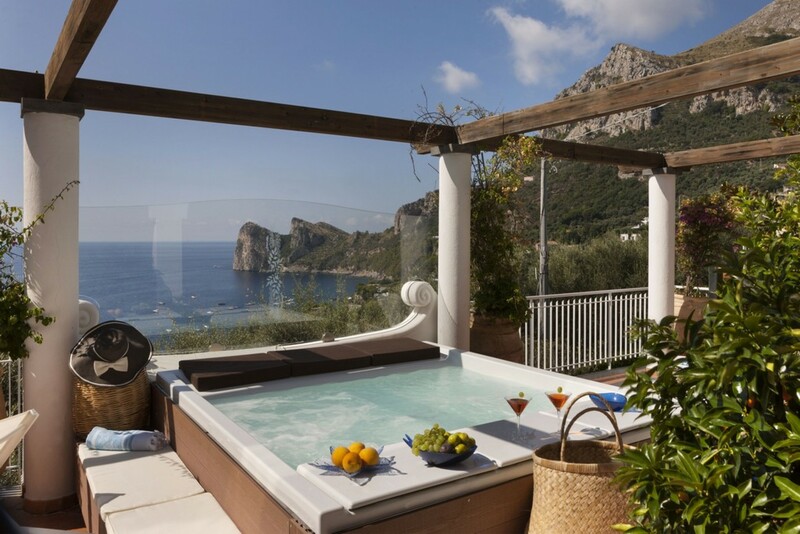 Indulge in an authentic Italian vacation in your very own private villa. 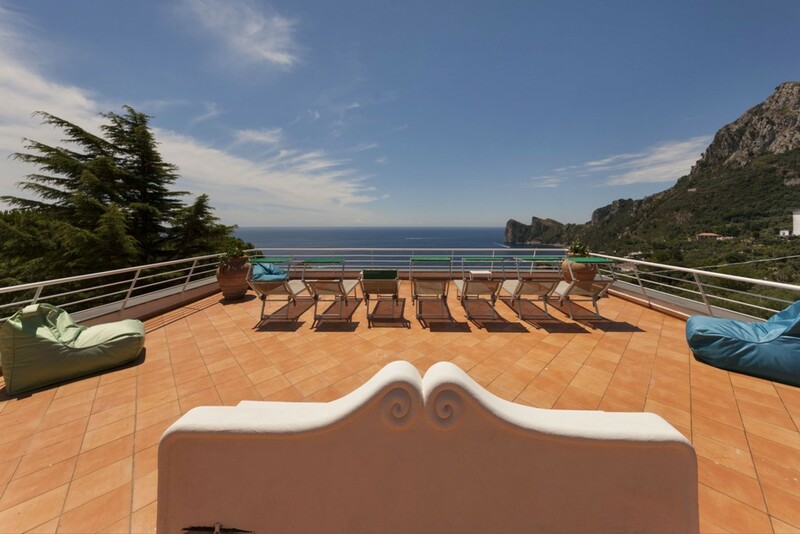 The villa is based along Sorrento’s beautiful coastline and is based near the local town and vibrant destinations. 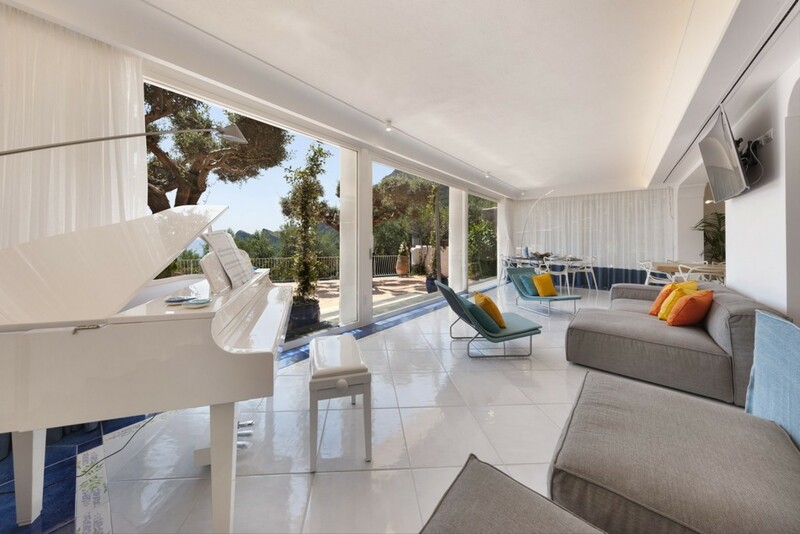 The Villa itself is perched atop the gently sloping hillside and is embedded in an area of landscaped gardens that are manicured and bursting with vivacious greenery. 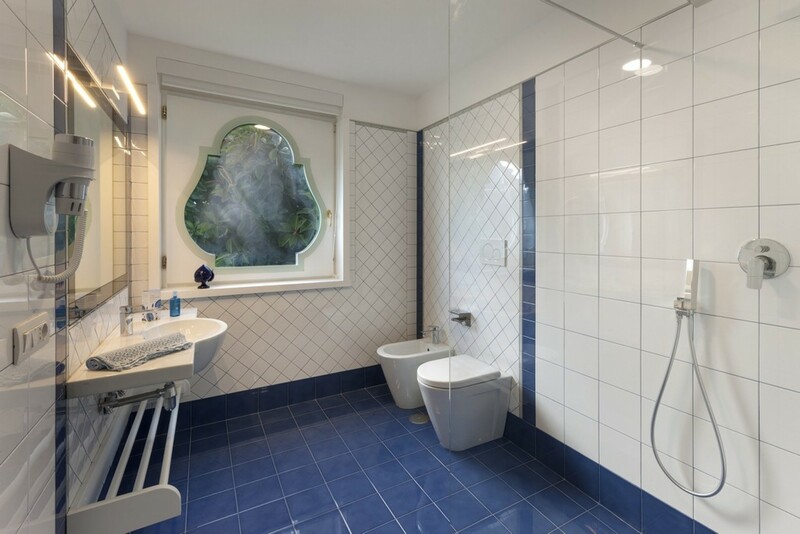 The property offers a sense of seclusion and tranquility as it oversees the Bay and yet is moments away from any amenities you may need during your stay. 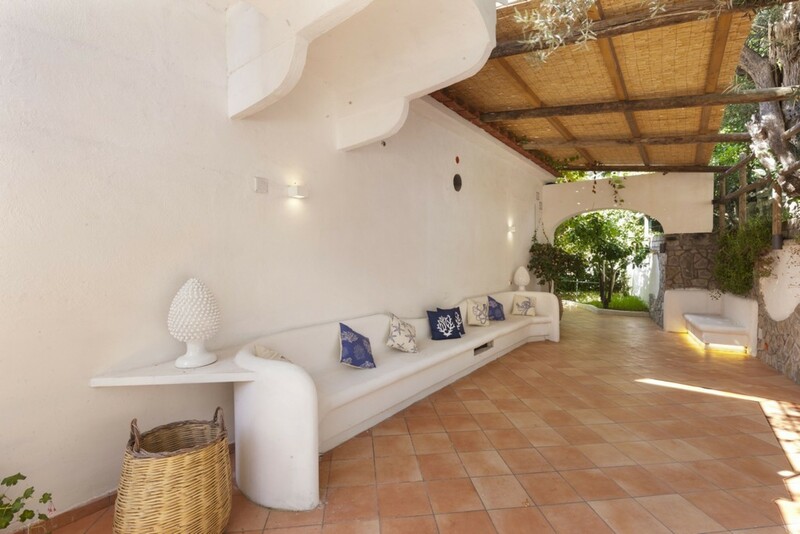 The villa is designed with a typical whitewashed design, and stone exterior, harmonizing with the local area and creating a modern ambiance. 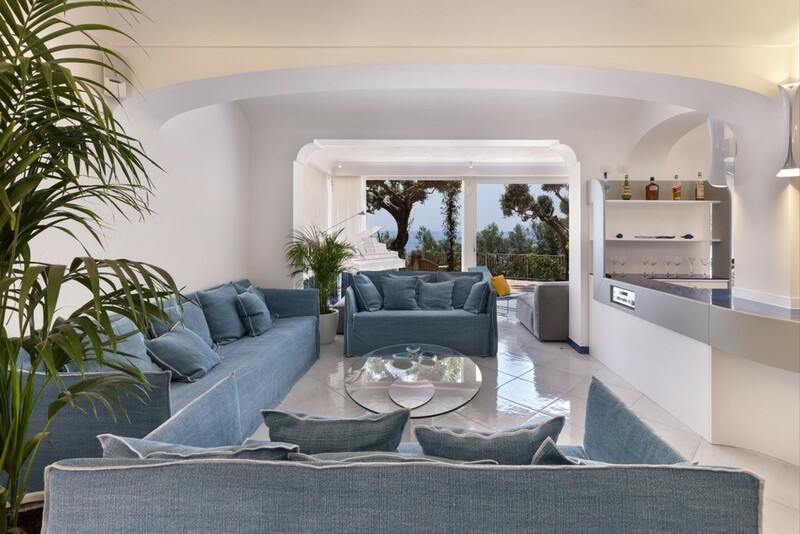 Making your way into your modern, chic villa, you will immediately notice the endless views of the Mediterranean Sea from the main living areas. 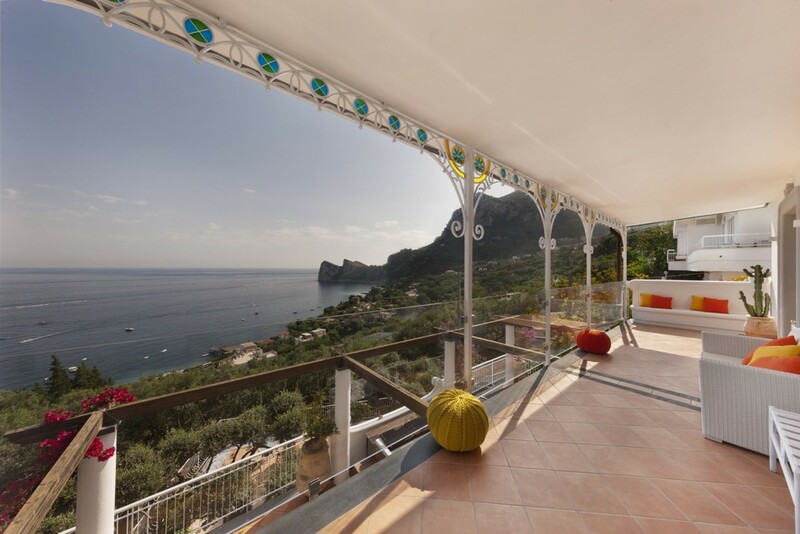 This panoramic position overlooks Marina del Cantone, the local fishery village based near Sorrento. 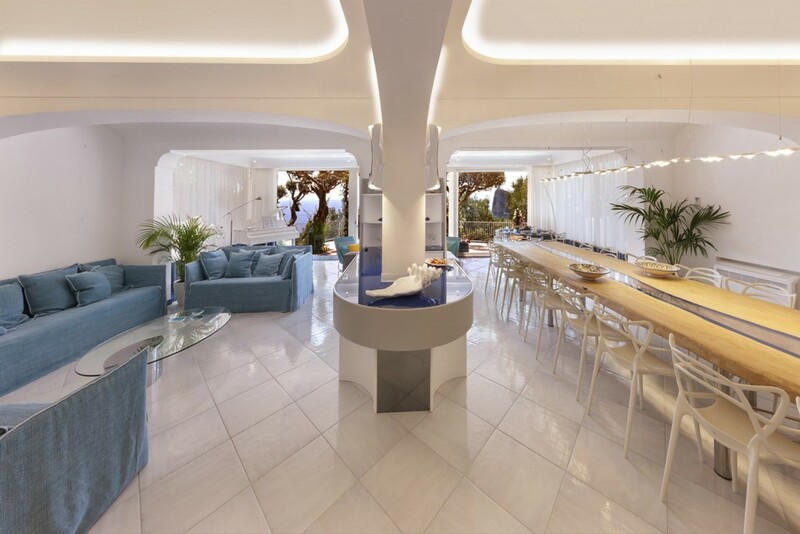 The villa encompasses an abundance of space and is composed of three floors. 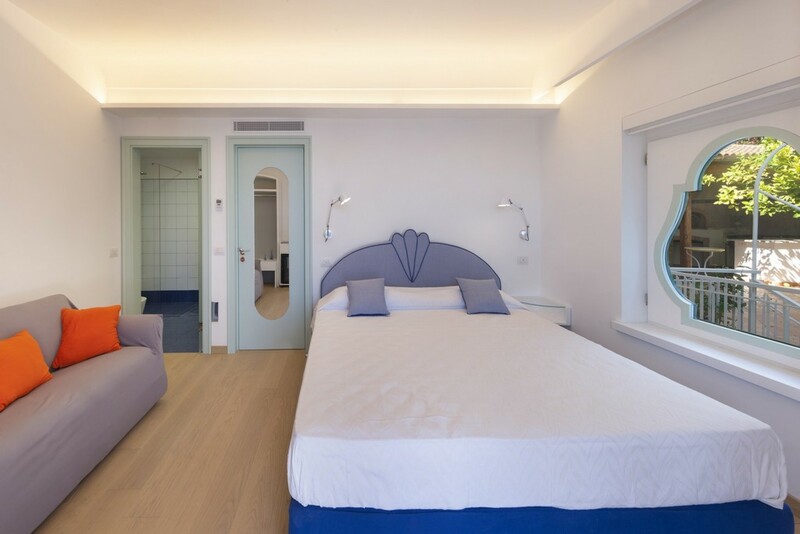 The interiors are recently refurbished and designed to reflect a simplistic and yet traditional Amalfi style. 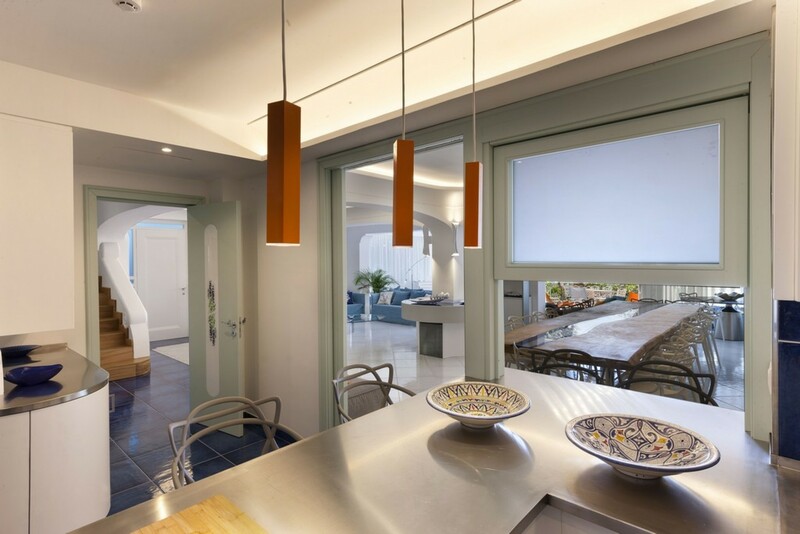 The entrance leads you into the open plan living space which features a profusion of lavish furnishings, whitewashed walls, high ceilings, and smooth tiled floors. 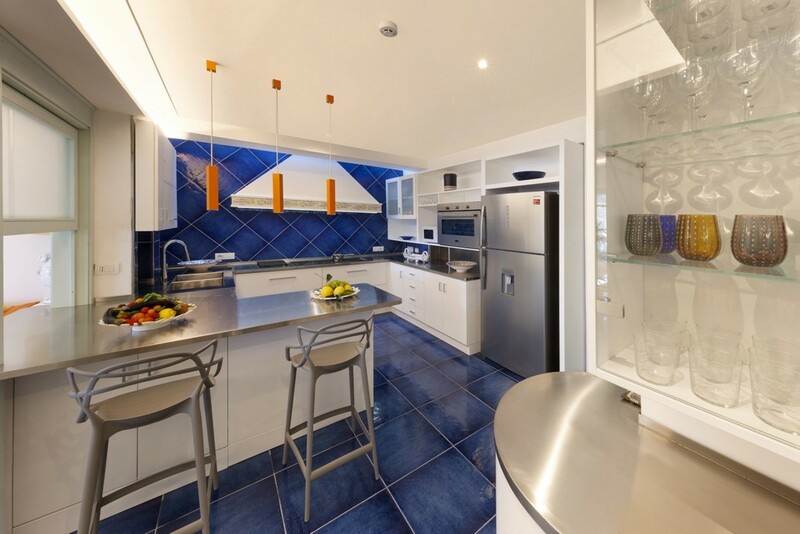 The kitchen is at the back of the room, laced in bold blue floor and wall tiles. 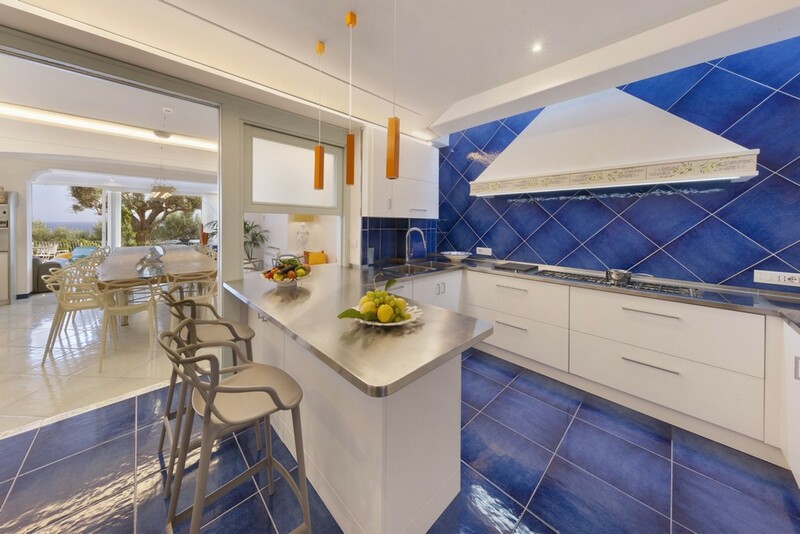 The kitchen comes fully equipped and includes a delicate breakfast bar that seats four guests. 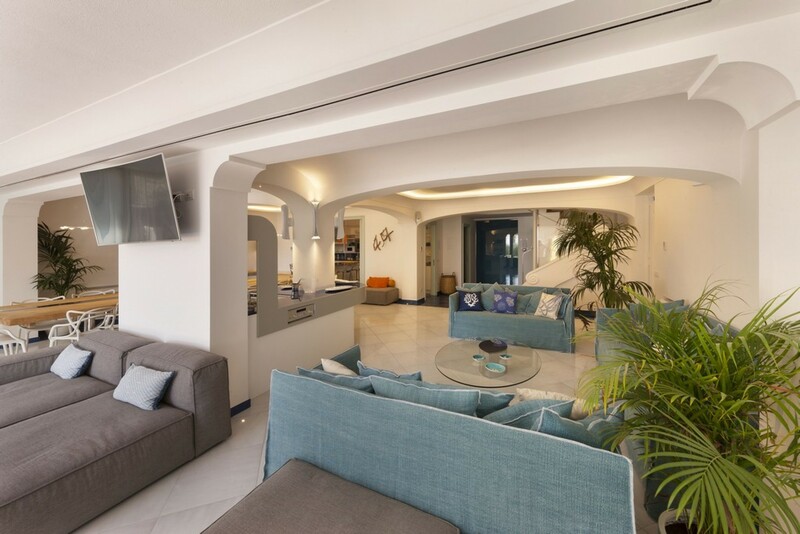 Through the open archway, you will then be in the spacious living and dining area, separated by the minibar in the center. 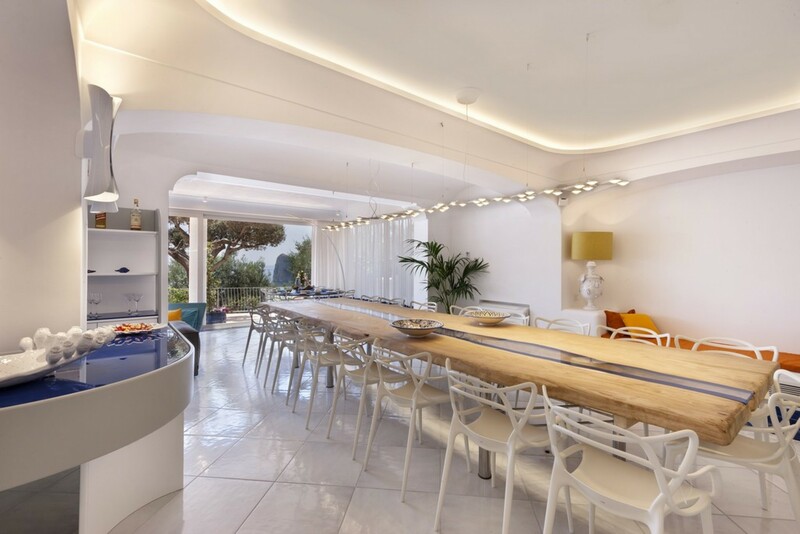 The dining area is fitted with an elongated wooden table, seating a total of eighteen guests. 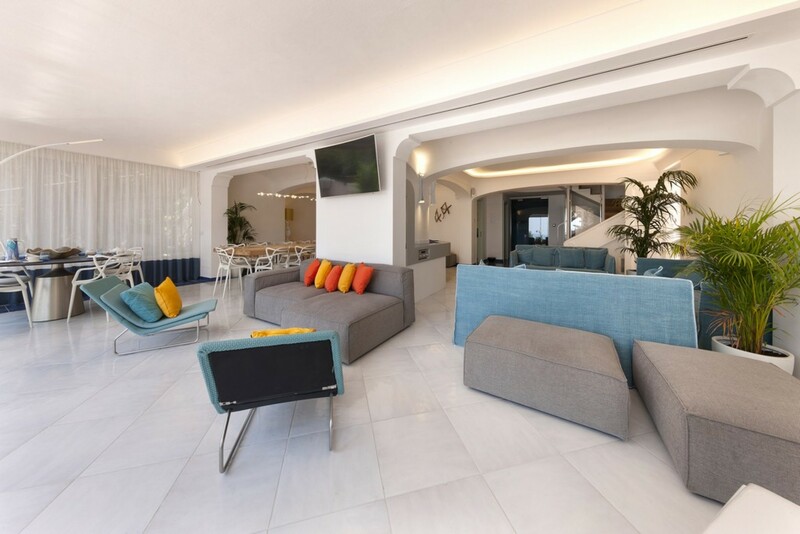 The living area includes several plush blue sofas and enjoys direct access out onto the covered outdoor seating area. 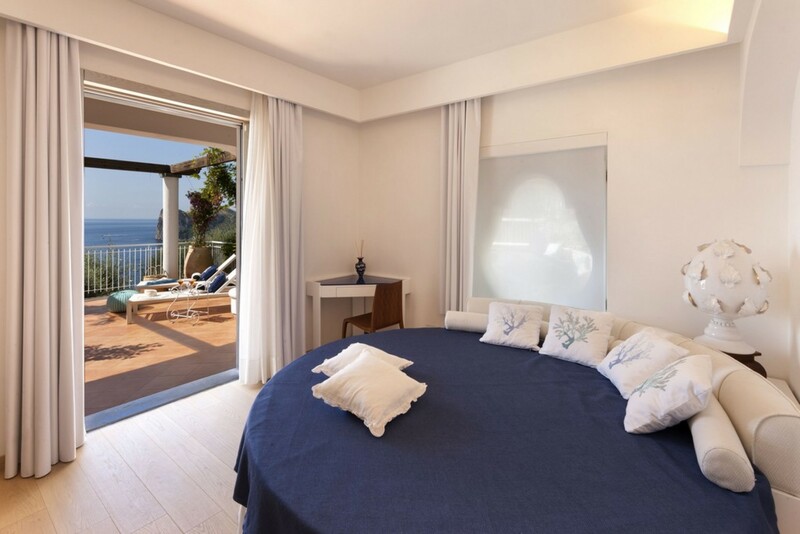 Taking the lift or the stairs up to the second floor, you will discover the villas luxurious bedrooms. 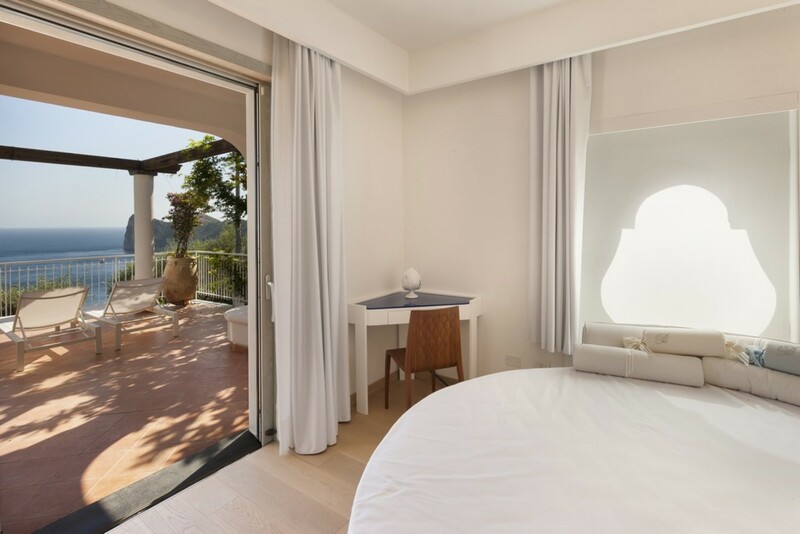 All the villa’s bedrooms are based on the first and second floor. 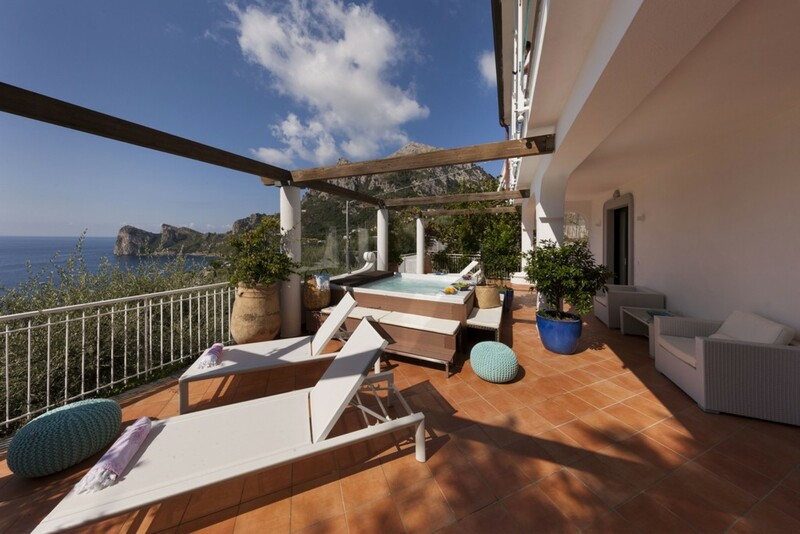 The villa indulges in a total of seven lavish bedrooms and eight bathrooms. 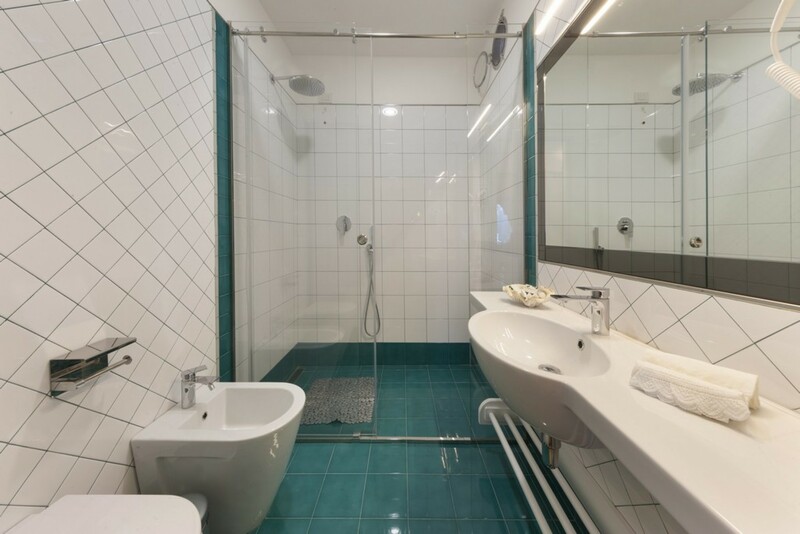 Each of the seven rooms offers their own private en-suite bathroom with either a rainfall shower. 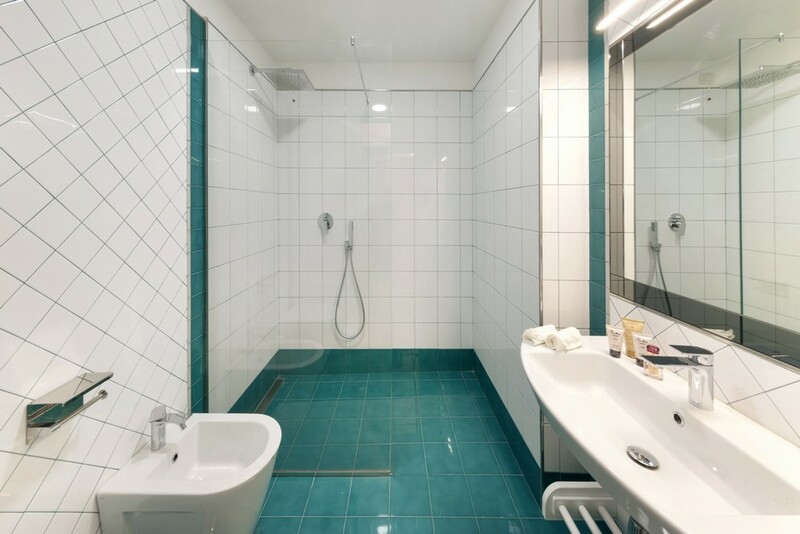 The rooms are equipped with fresh linens, towels, mounted plasma screen TV’s, include air-conditioning. 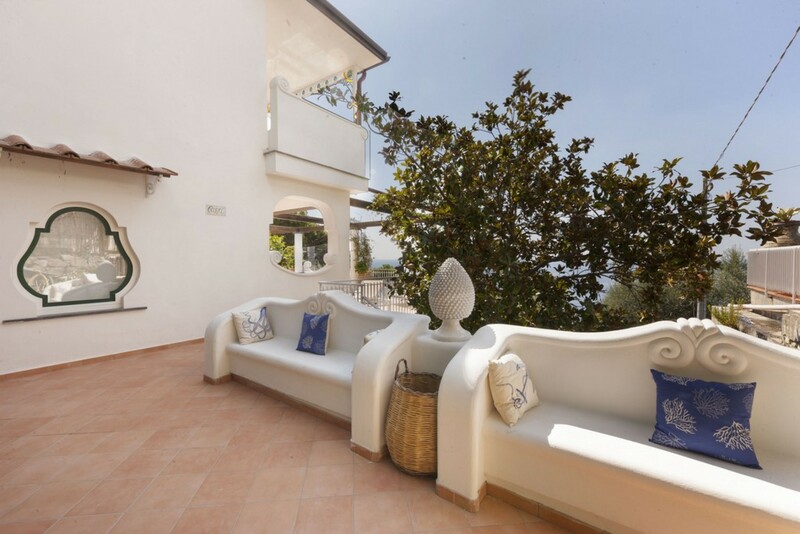 There is a total of six double bedrooms, five of which features direct access out onto the private ocean view terrace. 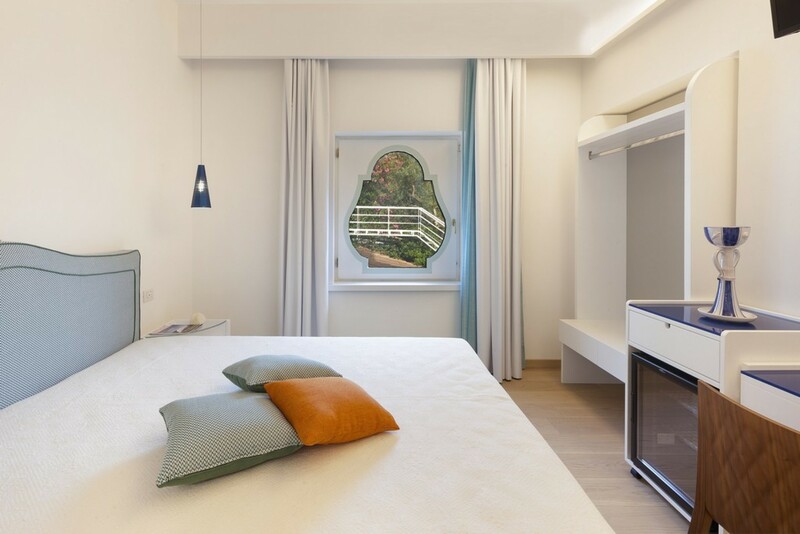 The seventh bedroom includes two twin beds. 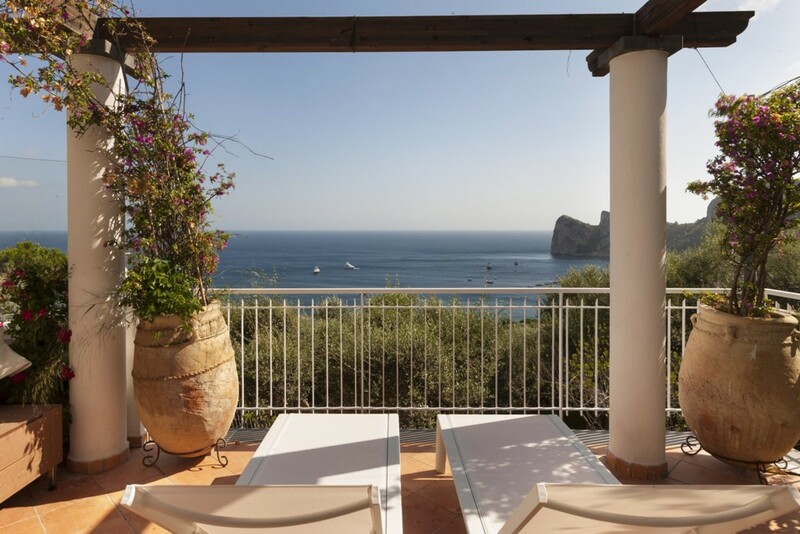 The villa indulges in two wonderful terracotta tile terraces overlooking the Mediterranean. 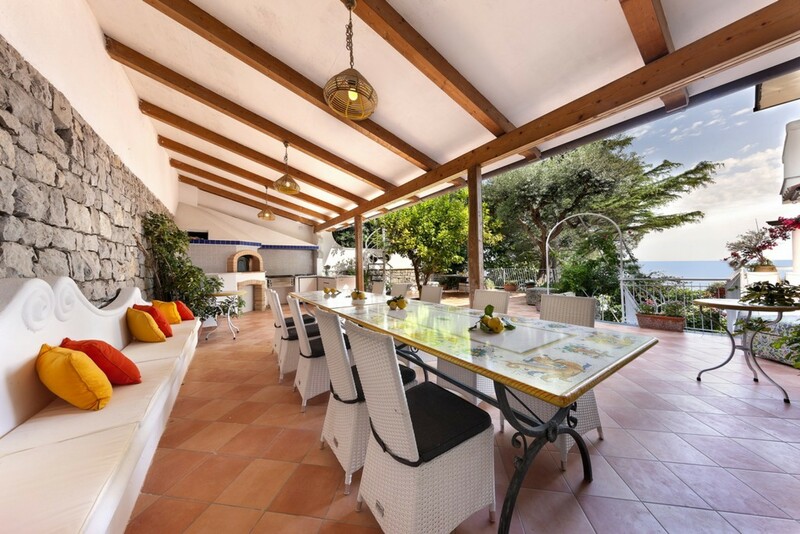 With endless views, this spacious outdoor living area supplies you with an authentic Italian lifestyle. 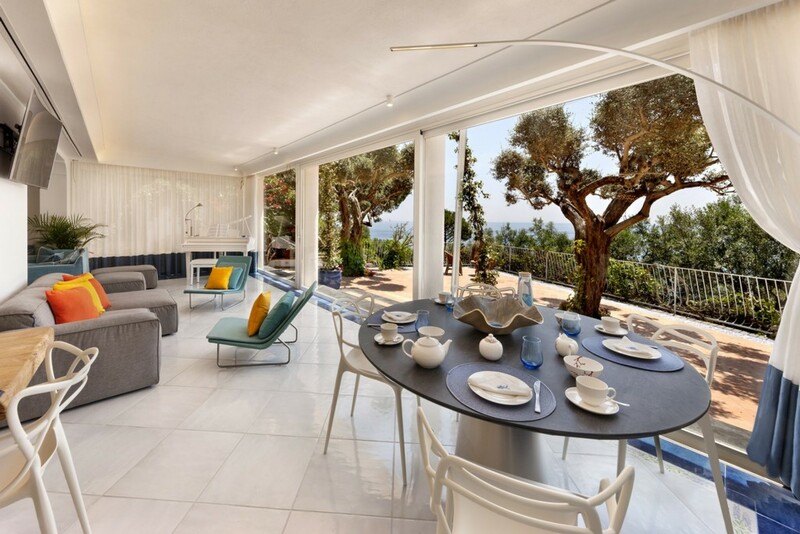 The terrace is bursting in vivacious greenery and comfortable lounge areas. 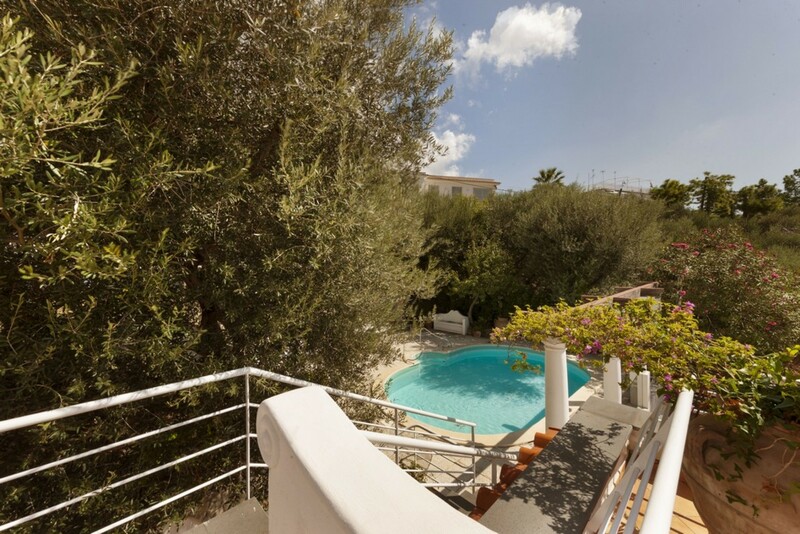 In the mornings you can make your way to the silky waters of the private swimming pool for a refreshing swim. 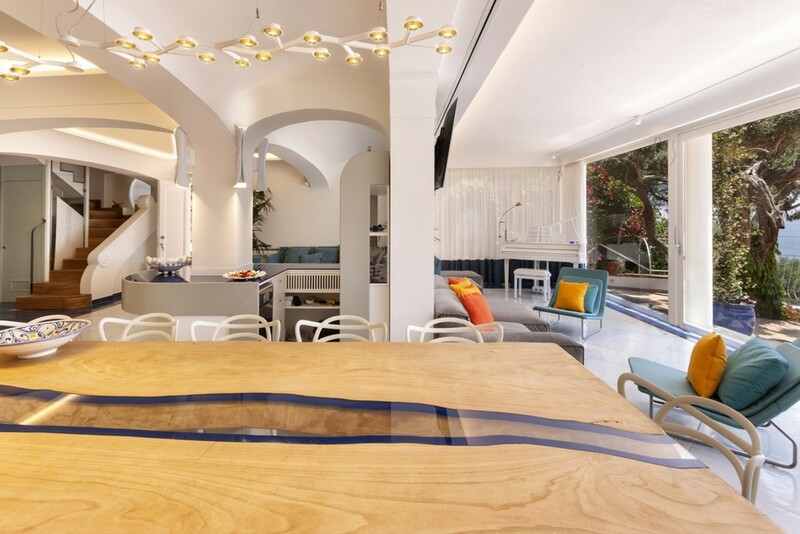 Dine out on the terrace in front of the living area as you delve into some delicious Italian treats. 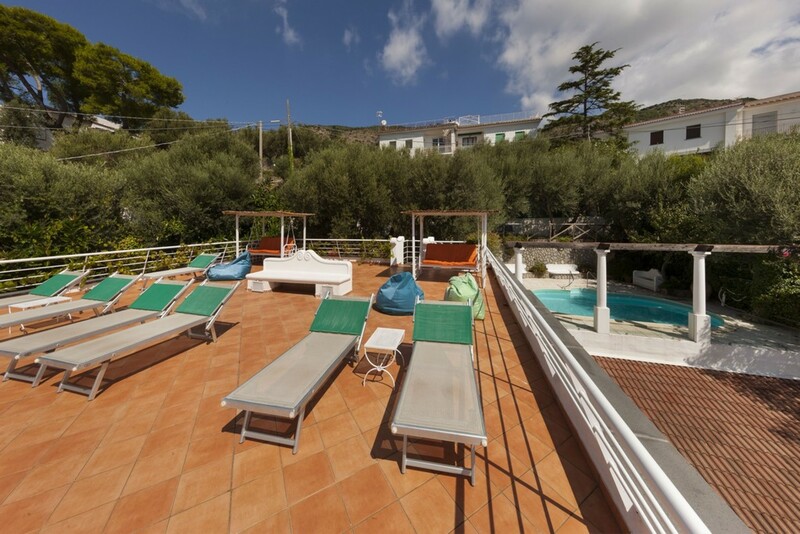 This sea-facing terrace includes many sun loungers, perfect for soaking up this sun-soaked location as well as a bubbly Jacuzzi. 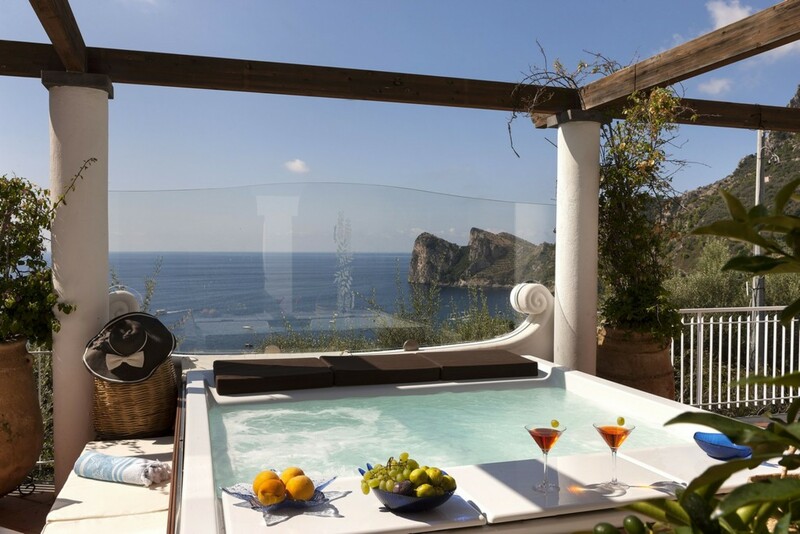 During the late afternoons, you can watch the sky fade from a soft pink to a deep midnight blue, as you relax in the jacuzzi, sipping on a refreshing drink from the mini bar. 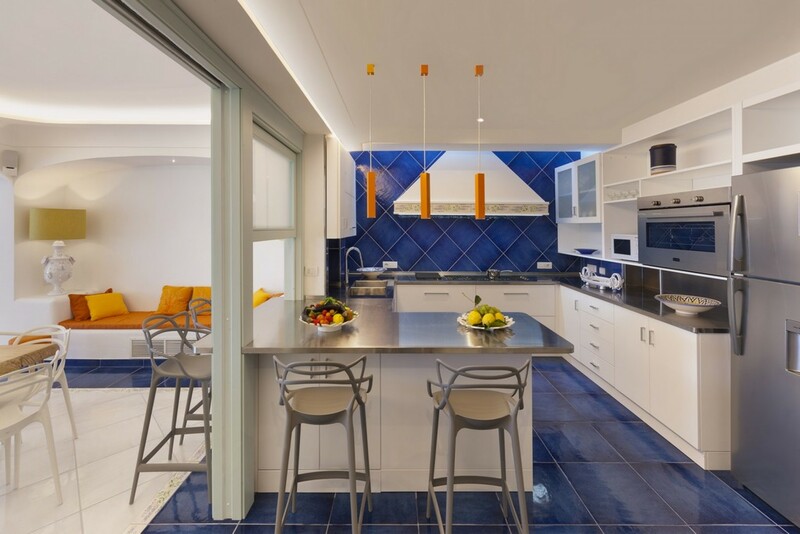 The second terrace offers something a little different, including a Barbeque area with a wood-burning oven and outdoor kitchen. Dine alfresco under the stars as you spark up the barbeque for some sizzling treats. 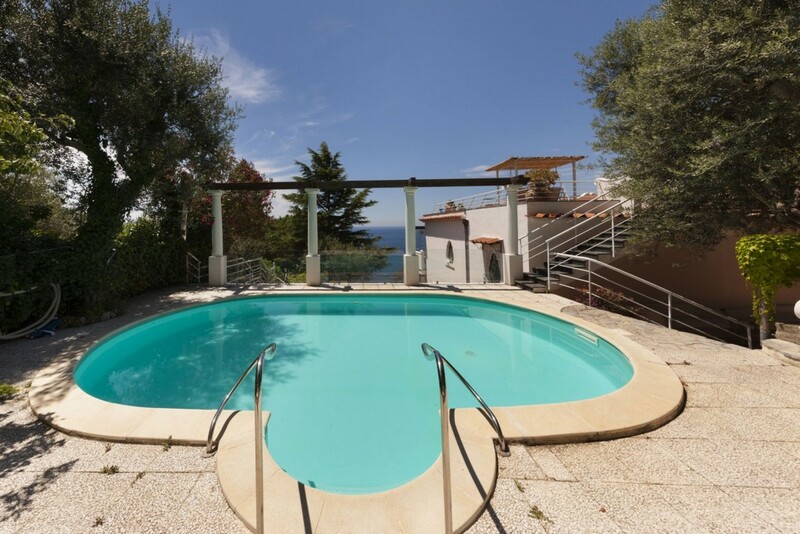 No matter where you are in Villa Marinella, you will always be submerged in endless luxurious and panoramic views of the breathtaking Italian coastline. 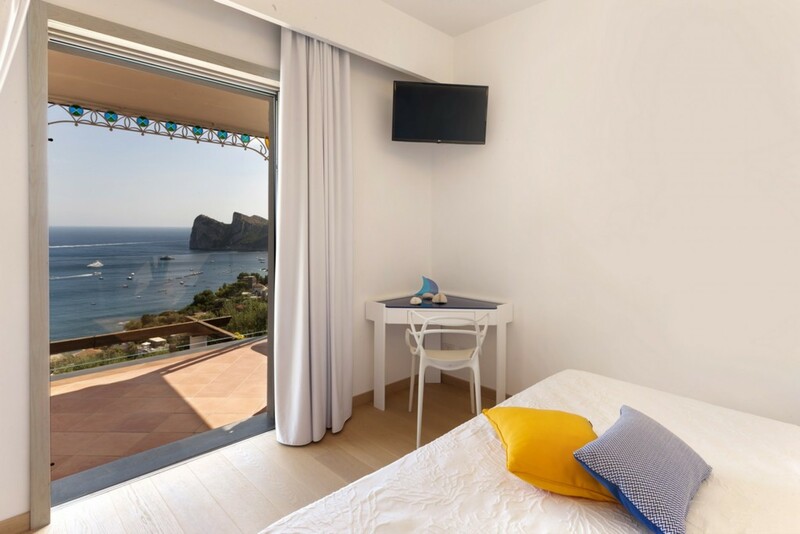 Bedroom 1 Master: Luxurious Double Bed, Private En-suite Bathroom, High-resolution TV, Air-conditioning, Access onto the private Patios, Ocean Views. 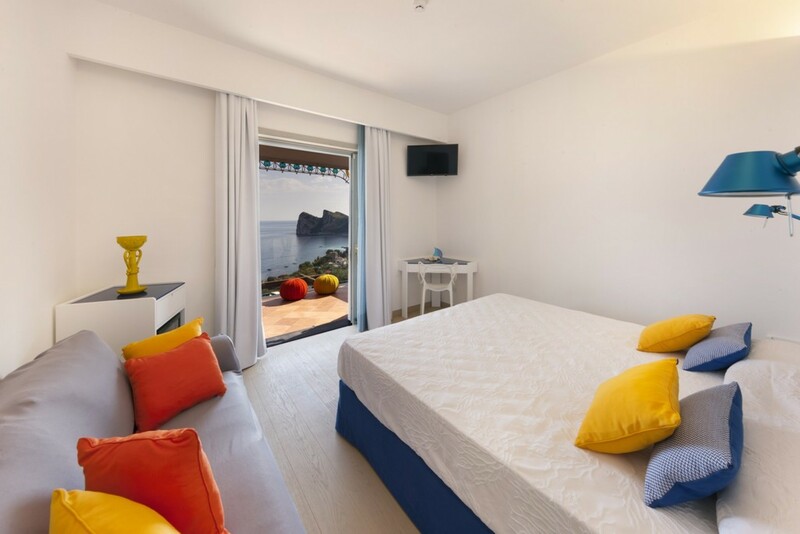 Bedroom 2: Luxurious Double Bed, Private En-suite Bathroom, High-resolution TV, Air-conditioning, Access onto the private Patios, Ocean Views. 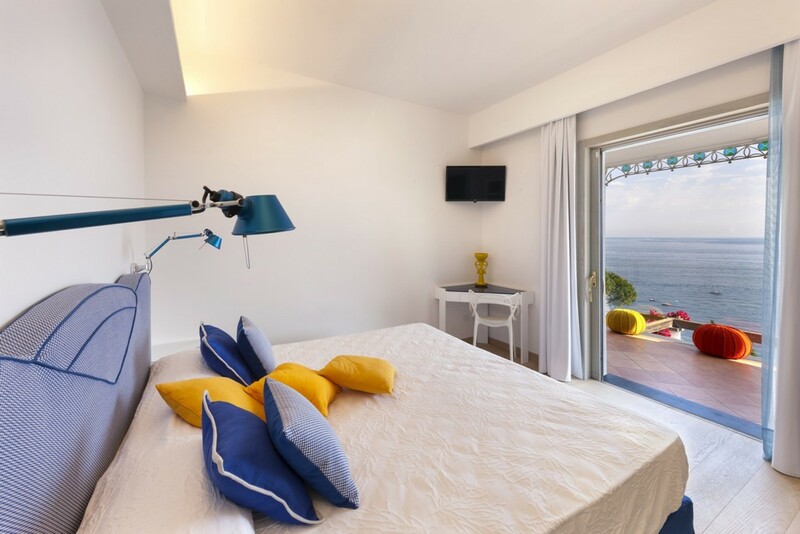 Bedroom 3: Luxurious Double Bed, Private En-suite Bathroom, High-resolution TV, Air-conditioning, Access onto the private Patios, Ocean Views. 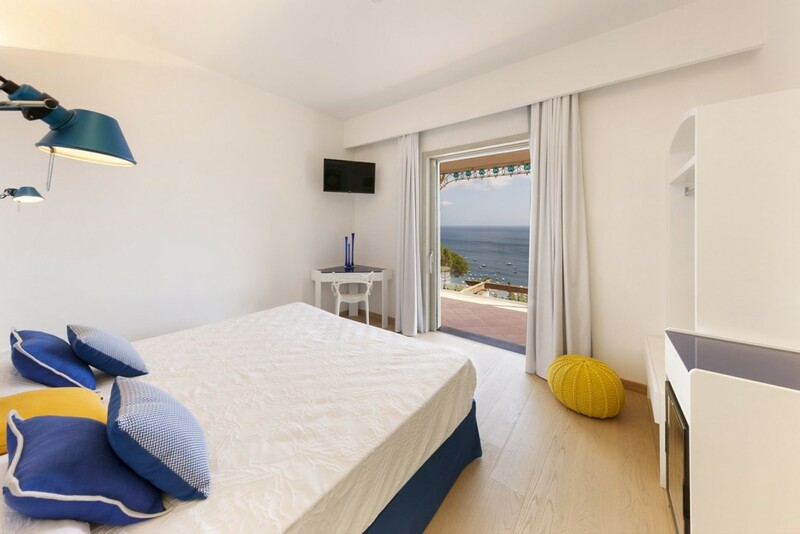 Bedroom 4: Luxurious Circular Double Bed, Private En-suite Bathroom, High-resolution TV, Air-conditioning, Access onto the private Patios, Ocean Views. 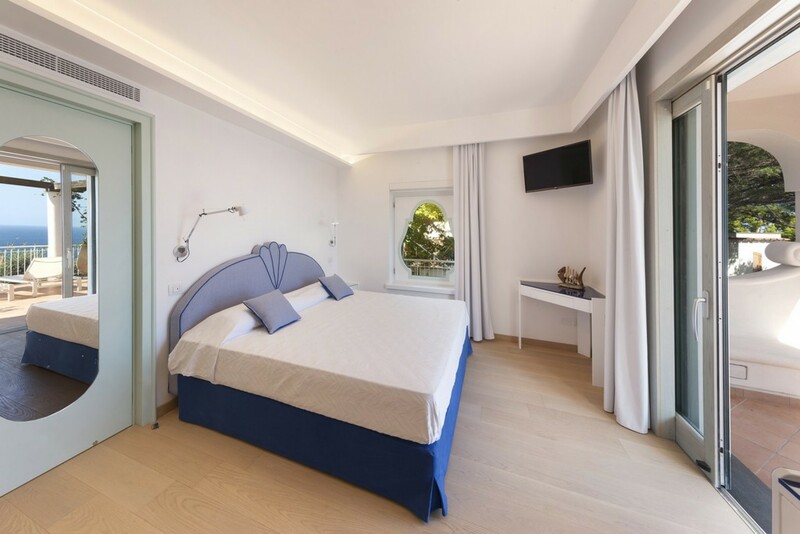 Bedroom 5: Luxurious Circular Double Bed, Private En-suite Bathroom, High-resolution TV, Air-conditioning, Access onto the private Patios, Ocean Views. 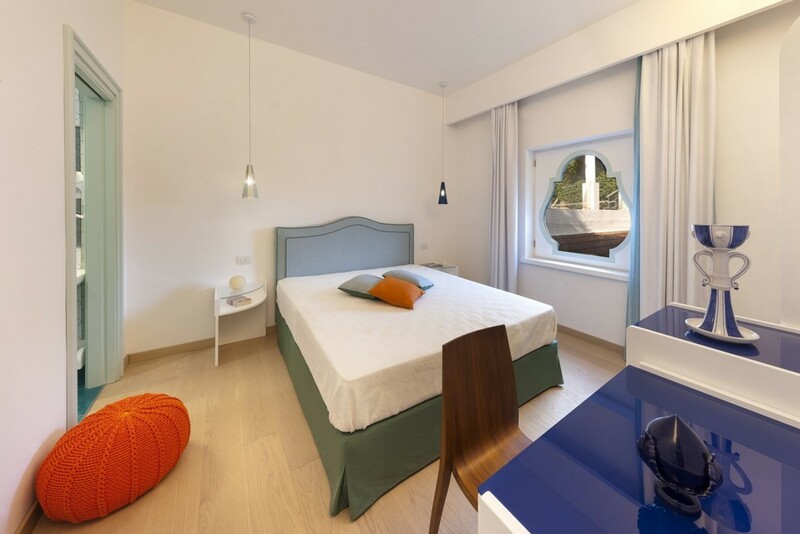 Bedroom 6: Luxurious Double Bed, Private En-suite Bathroom, High-resolution TV, Air-conditioning. 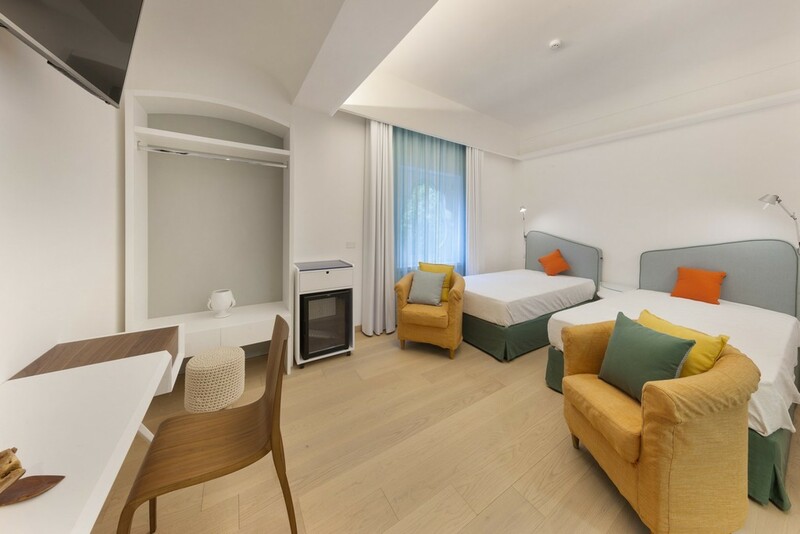 Bedroom 7: Comfortable Twin Room (2 Beds), Private En-suite Bathroom, High-resolution TV, Desk, Air-conditioning. 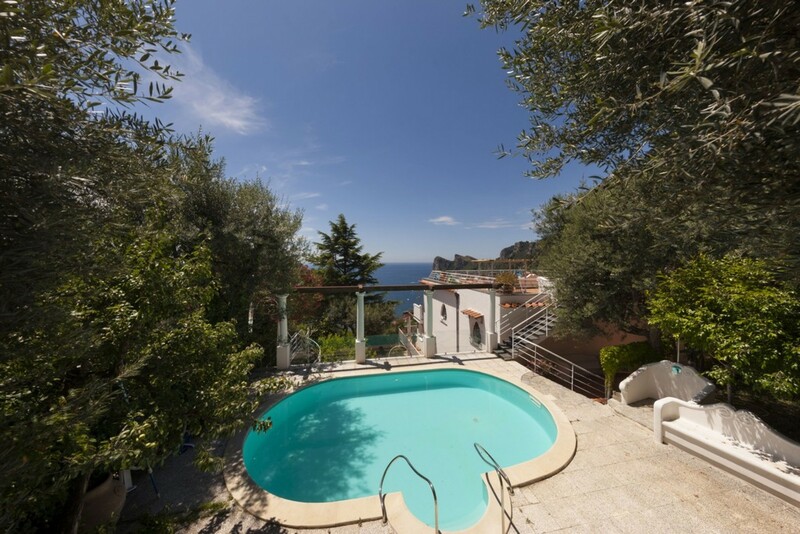 Villa Marinella is located in the Campania region, along with the Amalfi coast in Italy. 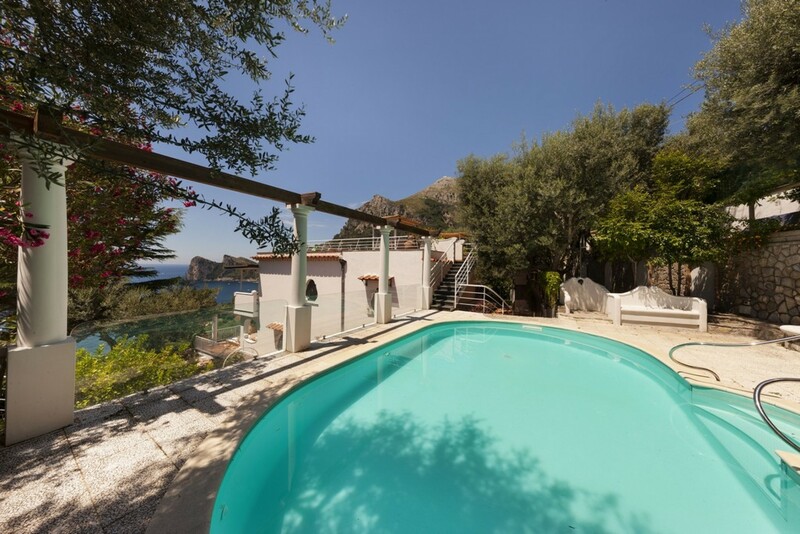 The villa is based in a serene coastal town in Marina del Cantone near the southwestern region of Sorrento enjoys panoramic views over the Bay of Naples on the Sorrentine Peninsula. 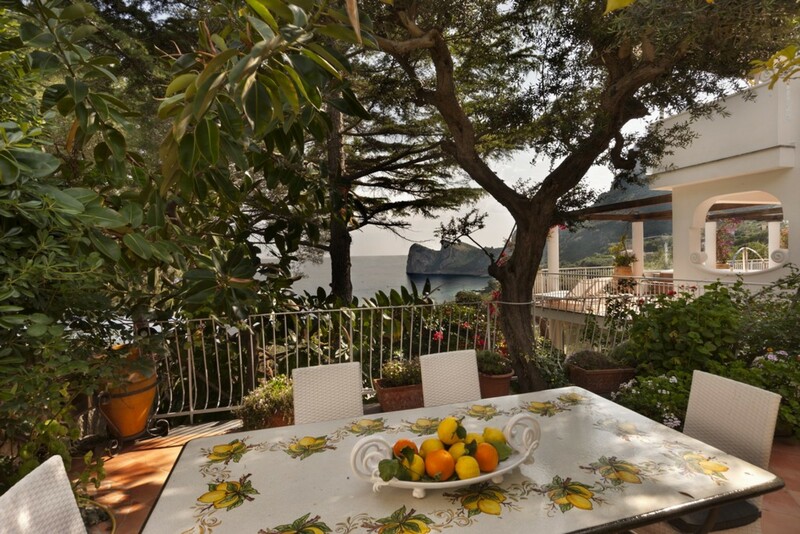 Perched atop the gently sloping hillside in Sorrento the local town is split into two areas, the town, and the marina. 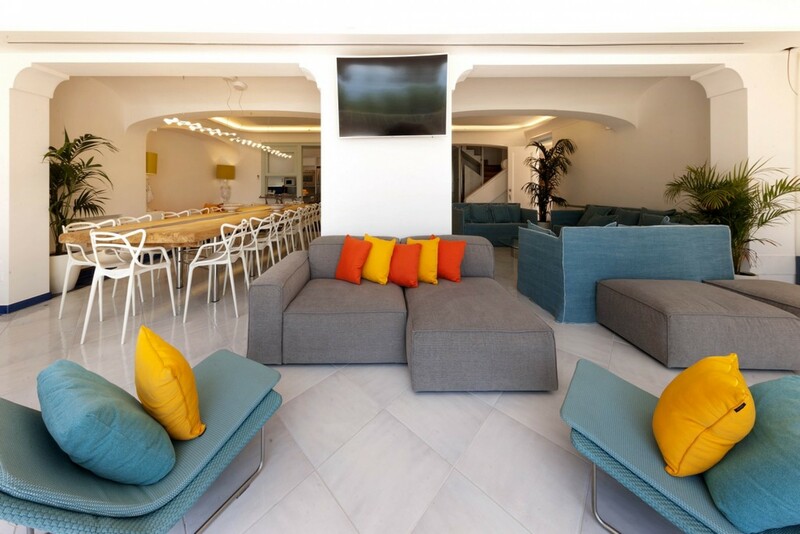 Some of the key features include the Piazza Tasso or simply strolling along the cafe-lined square and experiencing the vibrant atmosphere. The town also holds a historic 14th-century church that is known as the Chiesa di San Francesco.